diabetic and blind but don't count her out! Around 12 years with diabetes and cataracts but still going strong and too cute! The glasses protect her eyes, we don't want her walking into sticks, or weeds when she is outside. NOTE FROM LINDA ABND MAX: Wow! 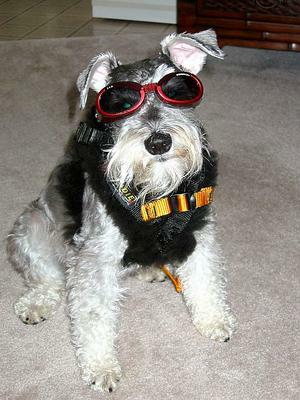 She looks like she's only a teenage schnauzer with those glasses and certainly looks like she is enjoying life with you.